Anna Johnson always knew she wanted to work with livestock. Growing up in in the countryside of Suffolk, England, Johnson helped neighbors lamb. She was hooked from an early age on working with animals. 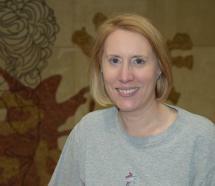 After getting a degree in animal science and master’s degree in the UK, Johnson came to the United States to earn her PhD at Texas Tech. A job at the National Pork Board in Des Moines brought her to Iowa and it was there that she began to regularly interact with livestock specialists at Iowa State. When a position opened to make the move to Ames, it was an opportunity she jumped at 12 years ago. What do you do for ISU Extension and Outreach? My program is on farm animal behavior and animal welfare. What is the best part of working for ISU Extension and Outreach? Working with producers. They are engaged, they are thoughtful, they are wanting to learn and change and be better. They’re progressive and they are just fun people. What drew you to Iowa State? The people who were already here. I came from the National Pork Board in Des Moines, so I had worked with a lot of the pig people. These pig people are smart, smart people and fun, but they push you. I saw so many opportunities to become engaged. What’s your next big project? I’m on the committee that has been invited to write the educational program for the common swine industry audit. That’s a huge program that’s been many years in the making. Name one fun thing about yourself that not many people know. My license plate says PIGDR – people know me as pig doc. It’s an ISU license place with the British Union Jack around the boarder. It’s an homage to my blended life. I like dog training a lot, that’s my release. Hanging out with my kids, they’re my center so I’m kind of their mom taxi. What is one thing you would like to accomplish in this position? My goal is to maintain the accountability on farm animal welfare, to have it at the forefront of people’s thoughts and not as an afterthought. If you get that right you are going to have good animals, healthy animals. How do you create a #StrongIowa? Smart creative tools – training programs, online resources, one on one, team based. If you give producers the toolbox and allow them flexibility to add, craft, change and use that’s going to make them so much better.